Joes For Tots ’09: The Contest That Helps Kids! Joes for Tots is back! It’s the yearly contest that helps kids out by encouraging donations to Toys for Tots. This year we have an even better selection of prizes. Why start so early? Well, we want to remind you as soon as possible that when you see a drop box this year, you might want to think about helping out some young ones. Let’s not draw this out though, let’s see what you can win (not all items shown in picture). Grand Prize: One grand prize winner gets to choose between a Star Wars prize package and a G.I. Joe package. 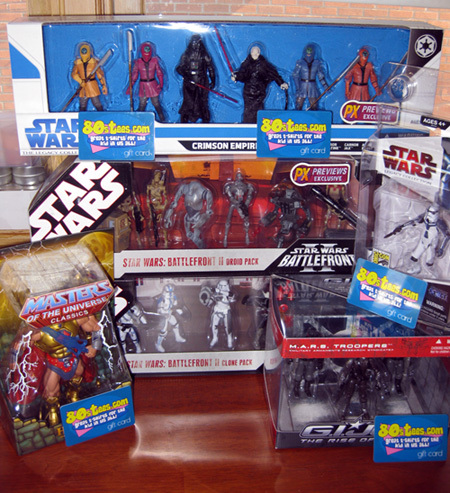 2nd Place: 1 Second Place Winner will get whichever prize pack the Grand Prize winner doesn’t want (Star Wars or G.I. Joe). Plus: (1) $50 credit at Big Bad Toy Store, (1) Back to the Future Minimates set, (1) Spirit Minimates set, (1) 24 Minimates set, (1) $10 gift cards to 80sTees.com,. Now how do you get a chance to win this stuff? It’s simple. There are two ways to enter. You can take a picture of yourself donating to a Toys for Tots drop off box and send it to me; OR proof of an online cash donation to their website (they send an email receipt that can be forwarded). Both entries should go to the email address winbigprizeswinbigmoney@gmail.com. Please include “Joes for Tots” in the subject line. While this contest originally started out as part of my master plan to seed G.I. Joes through Toys For Tots in order to get kids interested in the Joe team, I’ll happily accept contest entries that aren’t a G.I. Joe toy. You’ll just earn my respect and an evil cackle if you do decide to donate a Joe toy. (You’ll earn a severe frowning if you donate The Corps toys, though.) You can find drop off locations here or you can call your local Toys For Tots representative. Now I realize that you might be shy, so if you do the picture thing you can blur out your face or wear a mask, I’m not picky. Entries must be received by 12/31/09 in order to qualify. Winner will be picked randomly bay by an impartial third party judge. There will be more updates in the future which include the super awesome sponsorship spotlights. 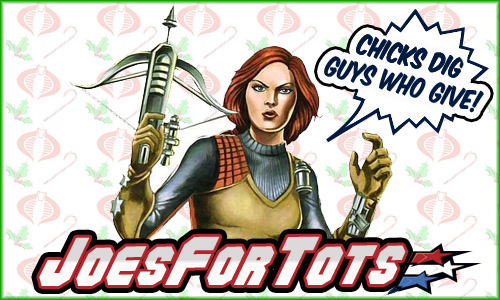 Also be sure to follow Joes For Tots on Twitter to get up to date news and even more extra fun stuff. Small Print: Contest winners will be notified on 1/14/2010. Grand Prize winner must select their prize package within five days of notification or a prize package will be selected for them. This contest is not sponsored nor endorsed by Hasbro. All likenesses and logos relating to G.I. Joe are entirely owned by Hasbro. This contest is also not sponsored nor endorsed by Toys For Tots. Likewise, the owner and operator of PoeGhostal.com is acting merely as a host for the contest news and updates, and is not responsible for organizing the contest, picking winners, or distributing prizes. Shipping is free to winners located in the continental U.S. Shipping outside of the U.S. will have to be paid by the winner. Not responsible for lost or misdirected mail. The contest is open anywhere there is a Toys For Tots drop off box. If you can’t donate to Toys for Tots (for example, you live in Canada), exceptions can be made on a case by case basis to donate to other worthy causes. Email your requests for exceptions to winbigprizeswinbigmoney@gmailcom with the subject heading “Contest Exception Request” as the subject line. Delivery for the contest winner: **The winner must allow 4-6 weeks after announcement of win to receive the product from Sideshow Collectibles. All prizes are non-transferable, with no cash redemptions and/or substitutions except at Sponsor’s sole discretion. See below for more International Shipping Terms. To get the latest news from Sideshow Collectibles, join our Newsletter! Delivery time & Restrictions: All continental US orders are shipped via either UPS or FedEx ground service. Because FedEx cannot provide tracking numbers for P.O. Boxes, Sideshow Collectibles will not ship to a P.O. Box. Please provide your street address or your shipment will be delayed. For FedEx Ground deliveries, please allow up to 6 business days for delivery from the date your order is shipped. International Shipping Restrictions: At this time Sideshow Collectibles is unable to make shipments to Venezuela or Nigeria. Please Click Here for further international shipping information and restrictions. All taxes are the responsibility of the winner. All prizes are non-transferable, with no cash redemption and/or substitutions except at Sponsor’s sole discretion. All international winners will be responsible for any duties, tariffs, taxes or import fees assessed to their prize. Further, some countries outside of the U.S. do not have reliable mail services. In the event that a prize has been stolen or mishandled during shipment to an international destination, Sideshow may not be able to replace the specific item and will substitute a prize at its own discretion. If the winner prefers a specific quicker shipping method, they are responsible to notify Sideshow immediately, and will also be responsible to cover the additional costs if any. At this time, we do not accept credit cards from Mexico. Refer to our Help Desk for alternative payment options. Very nice to see this; there aren't enough people who give to TfT. I've donated in past years, but did not know of this contest previously. I'll definitely send a pic in this year! Everybody give 'til it hurts! Sounds great, I can't wait to enter. Man, the grand prize winner if going to be crushed by all the prizes. Great work organizing this shindig Paul. If I donate 1300 toys is that 1300 entries? I know I got lucky last year, but how lucky did I get? Time for me to donate some toys! I've got the Battle Front Clone Pack . . . but you can never have too many clone troopers. You've really put together a great contest! I can't tell you how happy I am to be a part of it! i give ALOT to TFT each year. in fact this year i am going to either a shelter or a children's hospital and i am going to take all my loose joes. all the extras that seem to collect up and i am going to hang them on a Xmas tree like ornaments for the kids to take as they wish. It's one entry per person, so last year you were pretty damned lucky. When is the deadline for entrees?